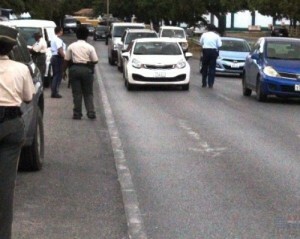 WILLEMSTAD - The Public Prosecutor, along with the Police Force Curaçao (KPC), has initiated the collection of traffic fines during police traffic stops. The project will take several months and is aimed at drivers who have an outstanding fine(s). If it appears that a driver has an outstanding fine then they opportunity to pay it on the spot. This can be in cash or swiping a debit card. Outstanding fines can also be paid at the ticket office of the Public Prosecutor in the Temple Building on the Hendrikplein in Punda.